The NSW Nitrogen Use Efficiency (NUE) Trial Project is a partnership between Dairy Australia, Hunter Local Land Services and South East Local Land Services. 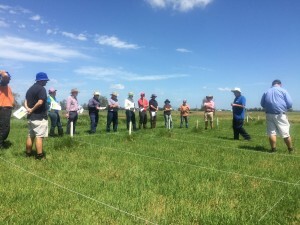 The objective of the project is to improve strategic use of nitrogen to increase pasture production and farm profitability, primarily concentrating on the feed gap experienced by NSW coastal pasture systems. The project was instigated by Manning Valley dairy farmer, James Neal. He believed that the right use of nitrogen in Autumn was being hampered by an inability to predict nitrogen requirements for Annual Ryegrass sown into Kikuyu, the pasture system managed by many NSW coastal dairy farmers. So how does Kikuyu effect Annual Ryegrass nitrogen requirement? When should NSW coastal dairy farms apply nitrogen, and how much, to increase efficiency and therefore profitable use of nitrogen? What are the ideal grazing regimes to optimise production and offer pasture within the ideal Crude Protein (CP) range? Based upon critical input from leading Australian nitrogen use experts who have come together as a technical reference group for the project, and the outcomes of a literature review- Fertiliser use efficiency in high input dairy pastures – Nitrogen mineralisation and availability under kikuyu dairy pastures on the mid-north coast of NSW, two trial plots have been established on separate sites located on the Mid North Coast and South East Coast to investigate the key questions in the field. Location: Oxley Island, Dryland farm of James Neal. Support Group membership: Commercial nutrient advisors and farmers of the Mid-Coast Dairy Advancement Group. Project Manager: Peter Beale, Senior Land Services Officer- Pasture, Hunter Local Land Services. Location: Bemboka, Irrigated farm of Susan Johnston. Supported Group membership: Farm Consultants, Bega field representatives, SELLS irrigation and pasture technical specialists and farmers of the Far South Dairy Development Group.